There are a few different types of tennis backhand groundstrokes which you can use to hit the ball effectively. The one-handed backhand, the two-handed backhand, and the slice backhand. All the backhand options have their strengths and weaknesses, however when implemented in certain strategic situations the selection can make a profound impact. There are two main backhand groundstroke stances, the neutral stance backhand which is more traditional and the open stance backhand which is more modern. Both types of backhands are utilized amongst professional players today and both can be effective at all levels of play. Unlike the forehand, the majority of tennis teaching professionals agree that both stances are beneficial for players to have in their arsenal. What is the Best Tennis Backhand Groundstroke? When the ball is around the center of the court and the player has enough time to set up for the ball most professionals will hit neutral stance backhands and when pushed off the court and need more time to recover players will tend to hit open stance or slice the ball back. Where debate lies is on shot selection when pulled off the court, whether to hit open stance or slice the ball back to buy more time and recover, it is a matter of court situation and strategy. There are different backhand grips to choose from, the continental grip, the semi-western backhand grip, and the eastern grip. The majority of the professional tennis players utilize a semi-western backhand grip for the one handed backhand, and a continental grip with the dominant hand and an eastern grip for the non-dominant hand on the two handed backhand. I prefer my students utilize either of the two options or something in between. With grips there is always a little wiggle room because each player will adjust slightly to what feels most natural. Both grips allow the player to drive through the ball and generate topspin effectively. An easy way to grip the racquet with the one handed backhand grip is to hold the racquet by the throat extended out in front of your body with your non dominate hand and your strings facing out in front of you, then place your dominant hand on the grip with your dominate arm extended as well. The footwork is the foundation of solid preparation and that is what we will focus on first. Before the ball reaches your opponents racquet you will want to try and time your split step so that your feet hit the ground at the exact moment you realize the direction your opponent’s shot is traveling. Now that you recognize the ball is traveling toward your backhand side you want to react to the ball. The first step is to pivot and load your weight onto your outside foot and begin rotating your shoulders and hips. Once complete you can push off your outside foot and react toward the ball. One thing you will find is that by rotating your shoulders and hips, your racquet will naturally begin to be taken back as well. You will find that your hip and shoulder turn will naturally take back the racquet in the preparation phase not the arms. However, the arms are used to control the racquet head angle and positioning while on the move. Once you approach the ball it is critical to focus on taking the necessary adjustment steps to ensure you have enough distance between you and the ball before setting your feet. Typically when I mention spacing I am referring to the horizontal distance between your body and the ball. Equally important however, is utilizing your movement to ensure the ball is going to rise or drop into your comfort zone, which is around waist high generally, before you set your feet. 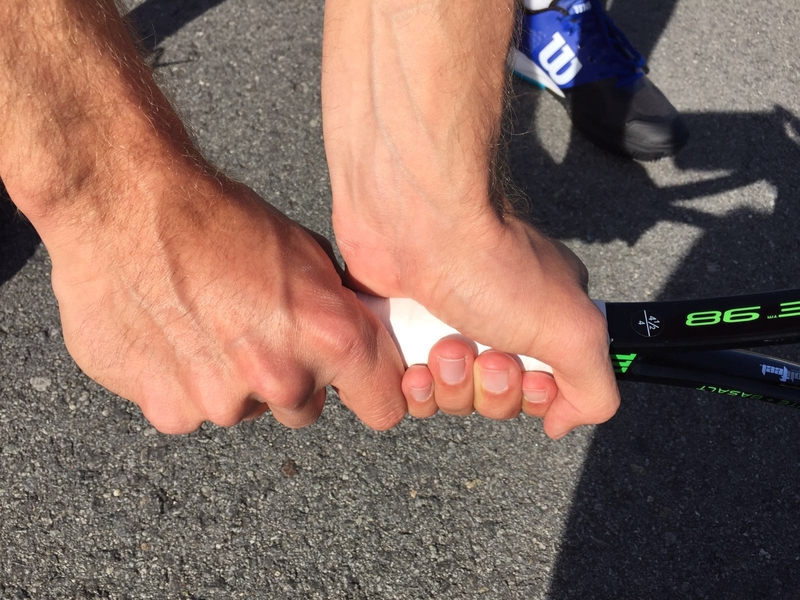 When on the move you want to change your grip to the backhand grip that you desire. The majority of tennis players have their dominant hand resting in the forehand grip when at the baseline and adjust the grip as needed. To change your grip you want to support the head of the racquet with your non dominant hand by placing it on the throat of the racquet for the one-handed backhand or by keeping your non dominant hand on the grip for the two-handed backhand. This will allow you to rotate the racquet with your non-dominant hand, which will be a slight turn, until you reach the desired backhand grip. Then you simply re-grip the racquet with your hand, keeping it slightly loose to ensure your hand doesn’t get tired. The shoulder and hip turn happen at the same time as your grip change. Now that you have the proper grip and you have the ball in your comfort zone, you want to set up your feet and upper body to stroke through the ball. You want to load your weight onto your back foot, which is the left foot if you are right handed, and step into the ball with your right foot. Ideally your feet will be lined up as if you were riding a skateboard or snowboard, which will allow you to open up your hips and shoulders efficiently. This stance will point your shoulders and hips in the direction you want to hit the ball. To load your weight onto your back foot try bending your back knee slightly as if you were going to begin sitting down. I find it more difficult to transfer my weight into the ball on the backhand, however by starting with a great load on the back foot sets the stage for a quality weight transfer. These backhand groundstroke tips will help you prepare to hit an effective stroke whether you hit with one or two hands. Some of the items mentioned such as the grip change and the set up with the feet may seem foreign and challenging at first, however overtime you will build the muscle memory and be able to focus on another area of your game to improve. On the next post we will cover the tennis two-handed backhand groundstroke. Let me know your thoughts and what you find helps you set up for the backhand groundstroke effectively by leaving a comment below. Cheers!